David Oldfield has today (May 19) been appointed as Peterborough United’s assistant manager. Oldfield spent the final few weeks in the role last season. He was assistant manager to Jimmy Floyd Hasselbaink at both Burton Albion and QPR before the pair left Loftus Road last November. They had previously led Burton to promotion from League Two before leaving ‘The Glovers’ when they were challenging for promotion from League One, a feat they completed under Nigel Clough. 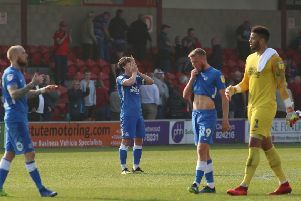 Posh manager Grant McCann said: “It was a no-brainer from my point of view and I am over the moon. To have his expertise and experience around me and my staff is fantastic. Since he joined us at the end of last season, the boys bought into his ideas. He is an excellent coach and has great experience of this league. “What he achieved with Burton alongside Jimmy was superb. It is a great addition for the football club. It will help us moving forward and I am sure he will help the players on the training ground improve.